Wat Xieng Thong (Xieng Thong Ratsavoravihanh, or Volavihan, the Golden City or Golden Tree Monastery) dates back to the 16th century. King Setthathilat (1548-1571) founded it in 1560 to commemorate the memory of the Chanthaphanith, a betal merchant and the legendary first king of Luang Prabang. 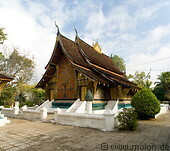 It is one of the most important of Lao monasteries with over twenty structures on the grounds including shrines, pavilions and residences, in addition to its gardens of various flowers, ornamental shrubs and trees.